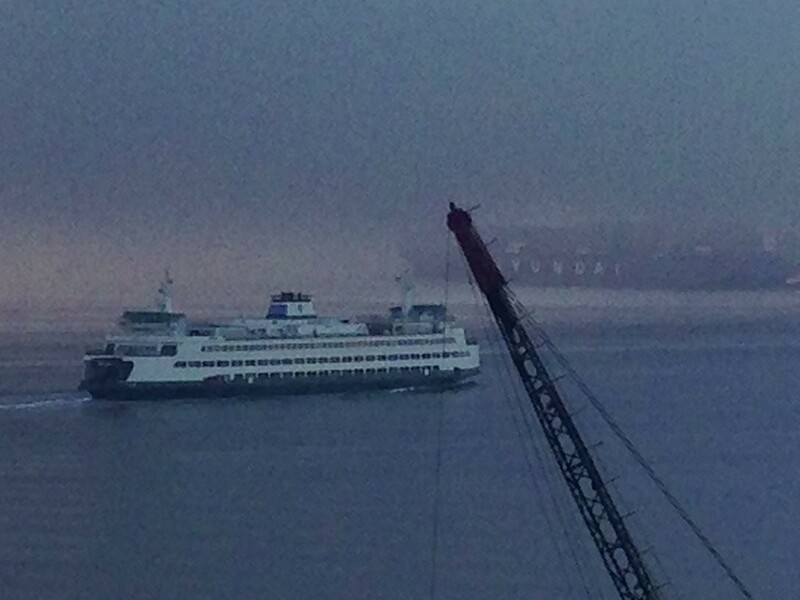 Foggy view from Lowells across Elliott Bay today! No matter what the season or the weather, our view is always interesting and always changing. With the fog the past few days, looking out over the Port of Seattle and watching the cargo ships and ferries come and go, its like watching a “film noir” unfolding before your eyes! It’s eerie, while at the same time, its naturally beautiful. Come down and see for yourself over a big bowl of steamer clams & garlic bread and a Manny’s Ale, OR, today we have our award winning “In-House Smoked Home-made Meatloaf Sandwich”, which is perfect for a day like this! House smoked bacon wrapped meatloaf with sundried tomato chipotle sauce on Macrina ciabatta roll with lettuce, tomato and Swiss… sloppy, smoky, hot and juicy with French fries on the side. It’s foggy outside, warm and comfy inside!